The Customize Windows > Computer and Internet > Cloud Computing > DynDNS & WordPress on Cloud : May Be You Really Need? DynDNS & WordPress on Cloud : May Be You Really Need? We are writing this article on DynDNS Service in easy language. We are avoiding technical matters to make it understandable to the most. We are not going to discuss about Anycast network or points of presence (PoPS). How many servers we need to pass to reach thecustomizewindows.com? (1) where it is hosted (2) root server (3) DNS Server. DynDNS & WordPress on Cloud : Why Not Web Host’s Free DNS Service? In most cases, Web Host’s free DNS service has no Service Level Agreement! If you ever used your own DNS service, you definitely know how much extra query reach to the domain. If that part is not properly managed, DDoS is obvious both on IaaS and PaaS. We deliberately discussed DDoS Protection Services for IaaS and separate DDoS Protection Services for IaaS separately. Basically, Web Host’s free DNS services are probably more restrictive and firewall policies are not “customized” by any human for a given domain. It is somewhat our conclusion from experiences. You’ll see that, when we search with some keyword on Google Web Search, some websites using free CloudFlare often throws a challenge webpage out of false positive. What exactly happens with Web Host’s free DNS service, that is not known. It is impossible to redirect some traffic for making money. After switching to any good premium DNS, your AdSense earning, traffic may slightly get increased. Web Host’s free DNS service is like using the Shared Servers. More money you’ll spend, DNS servers will have managed level, towards dedicated resources etc. Another thing we discussed is ANAME record. DNS Made Easy is for that ANAME record. In other words, if we wanted to talk about PaaS hosted WordPress, possibly we would talk about DNS Made Easy, not DynDNS. When we are talking about $7/month 6GB VPS service for the advanced users, adding a premium DNS service sounds ridiculous. Is not it? No. That is we have separate topic on Dedicated Server versus Cloud Server/VPS discussion in the context of WordPress. These “Original Service Providers” are not going to tolerate DDoS, Bad Traffic etc. Positive effect on Performance, Page Loading Speed etc. Google Public DNS is not a third-party DNS application service provider, such as DynDNS, that hosts authoritative records for other domains. Pricing DynDNS is based on tracking the 95% of your traffic (read DNS Overages & Using The 95th Percentile Burstable Billing Model from their website), and they lets you spike for a few days for free, but if you spike for say 72 hours as an example or more you pay for maximum 95% QPS registered during the entire month. You may accidentally leave your TTL short because you did maintenance and wanted to have 1 minute TTL to be able to switch to the new load balancer. In very short – lower TTL means use DDNS else use their recommended TTL. Dyn has $5/month and $30/month service. 1,000,000 queries per month is allowed in $5/month charge. $30/month service is for 5 times more usage. It is probably not cost effective. Some users have the complain of continuing billing despite discontinuation of service. Except Dyn, only NSOne is in front who provides DNS Service. 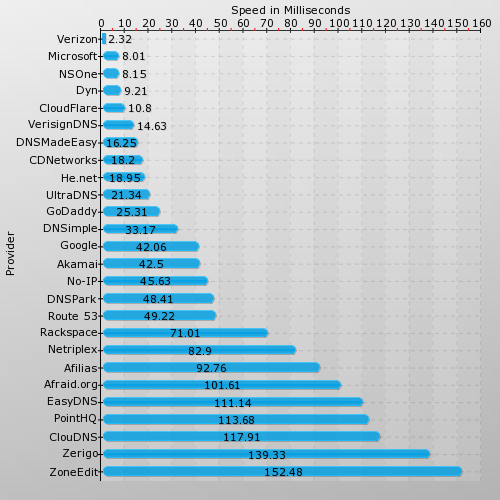 DNS by Microsoft is cheapest but has no SLA, no managed level. Who is this NSOne? NSOne is free up to ½ million USD queries/month. Next is $200/month. Keep in mind that, data changes. DynDNS lacks Geographical redundancy (which is bad). Rage4 – 15€/month with dedicated IP. DNS Made Easy – We are not talking about PaaS. Microsoft – No SLA. You wanted cheap. That is cheap but fast. That is why CloudFlare and DynDNS almost has monopoly. According our theory, few bigger companies usually has one single owner hiding behind. Volkswagen Group owns almost all the Automobile brands. This Article Has Been Shared 8774 Times! Articles Related to DynDNS & WordPress on Cloud : May Be You Really Need? Cloud Computing API is taken as a must have part as it can nicely integrate the dependency on demand computing power. Title: DynDNS & WordPress on Cloud : May Be You Really Need? Cite this article as: Abhishek Ghosh, "DynDNS & WordPress on Cloud : May Be You Really Need?," in The Customize Windows, December 22, 2015, April 21, 2019, https://thecustomizewindows.com/2015/12/dyndns-wordpress-on-cloud-may-be-you-really-need/.